Oftenly known as Sack Barrow, our Sack Truck is a traditional handling equipment which is a safe and effective way for an individual to move a heavy load. 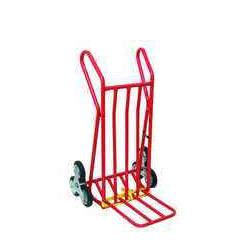 The body of this sack barrow is manufactured from high strength tubular steel and has a flat steel toe for easy location under the load to be moved. Hard wearing durable solid rubber tires with smooth running bearings ensure the barrow is as easy to manoeuvre when loaded as it is when unloaded. Rubber grips on the handles allow you to get a good grip. Supplied without the wheels fitted, push fit self-assembly required. Compact Sack Truck which unfolds in seconds. 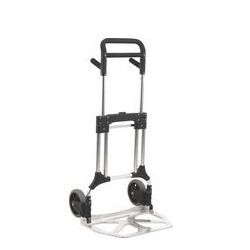 The aluminum construction makes it lightweight, simple to use & easy to carry. When folded, it can be stored or transported in confined spaces making them ideal for deliveries. 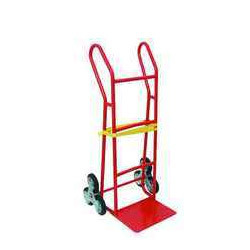 Our large compact sack truck as capacity of 200 kg. 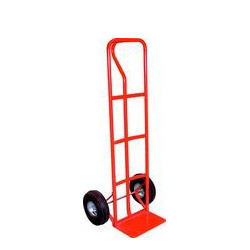 Heavy Duty 'P' Handle Sack Truck has a 200Kg capacity. 'P' Style handle for easy handling of heavy objects. Handle design keeps truck horizontal when laid flat. All tubular steel construction. Large 250mm pneumatic wheels for stable transport over uneven or stepped surfaces. Flat packed for user assembly. Fitted with 400mm long foot iron, 3 star wheeling with 125mm diameter polypropylene Tyre wheels for regular contact with stairs and curbs. Height x width - 1070mm x 610mm. Capacity 200kg. Tubular steel with double framed sides for increased rigidity. Looped handles provide knuckle protection and positive grip in various positions. Curved crossbar - suitable for carrying cylindrical items. Fitted with 255mm long footiron which has upturned back edge. 3 star wheeling with 200mm diameter rubber tyred wheels for regular contact with stairs and curbs. Height x width - 1275mm x 620mm. 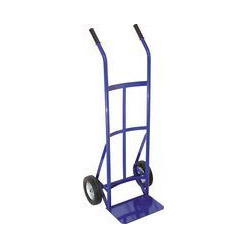 Looking for Sack Trucks ?